Summary: Just when seventeen-year-old Matt thinks he can’t handle one more piece of terrible news, he meets a girl who’s dealt with a lot more—and who just might be able to clue him in on how to rise up when life keeps knocking him down—in this wry, gritty novel from the author of When I Was the Greatest. First off, Matt Miller’s voice. I absolutely loved it! Matt is a character whom everyone can relate to because he is a thoughtful young man dealing with a life changing experience and is trying to make sense of his world. The novel begins just weeks after his mother’s death and he is still reeling from the grief, as any son who has had a close relationship with his mother would. He finds high school to be trivial, which makes sense because he’s lost his mother and his father is not handling his own grief in a productive way. In fact, his dad is loosing himself in alcohol and eventually winds up in the hospital leaving Matt on his own. Matt takes it upon himself to find a job and through a twist of fate, ends up working for Mr. Ray, the neighborhood mortician. And through this relationship the beauty of the novel comes through. Having survived cancer twice, Mr. Ray befriends Matt and basically becomes the father that Matt needs. Their relationship is touching and one of the strongest parts of the novel. The two are able to joke around with each other, but also share the secrets of their hearts. Matt is able to talk to Mr. Ray in a way that he doesn’t with his best friend or even his father. It’s clear that Matt respects Mr. Ray immensely and looks to him for advice and guidance. Their Thanksgiving, where they’re just watching football and talking about Matt’s date, is one of the best scenes in the novel. Being that Matt works in a mortuary, one of the main themes in this novel is death and grief. 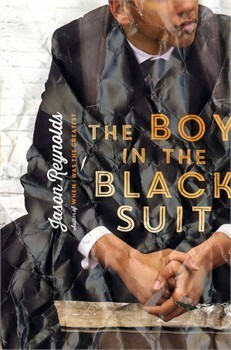 In the hands of a lesser author, “Boy in the Black Suit” could have failed miserably, but Reynold’s novel is a touching, quiet story that handles the concept grief with deftness that pulls the reader into Matt’s story and his journey through the grieving process. To understand his grief, and make sense of his mother’s death, Matt tends to watch the funerals, watching the family members, finding solace in the grief that they share. Again, in the hands of a lesser author, the modes of Matt’s grieving process could come across as odd, but instead, the reader feels for Matt, even empathizes with him. It was in those moments, when Matt was looking for answers to his grief in the tears of the other mourners that I really felt/connected with him. At no point, however, did I ever feel sorry for Matt and that is what makes “Boy in the Black Suit” such a powerful novel. Lastly, I enjoyed Reynold’s first novel, “When I was the Greatest”, but I loved this novel even more. The writing is much stronger and much more touching. It is a quiet novel with moments that pull at your heart strings and moments that make you laugh out loud. Matt’s story is one that is universal as we’ve all lost someone close to us and we must make sense of our grief and the loss of a loved one. It’s a novel of learning how to move forward after that person is gone and learning how to find one’s place in a family again. The book sounds wonderful, just received notice about it from the publisher too. Thanks for adding even more reasons to find & read. Loved this review and I have it on my Kindle and now must run and read it! Oh good! You’ll really enjoy it.